It’s that time of year again, time to celebrate Thanksgiving! These 5 Simple Toddler Activities are perfect for entertaining your kids just long enough so that I can finish up dinner without undercooking everything or burning down the house (kidding!). 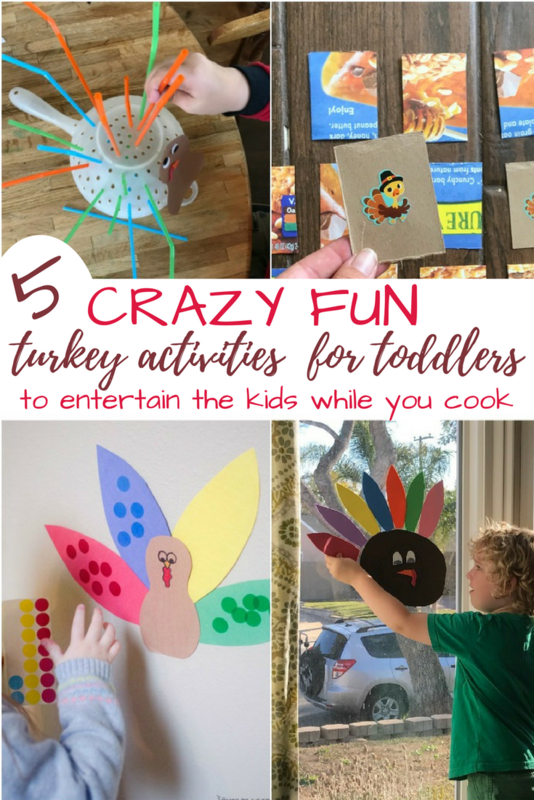 The kids and I tried out a few quick and easy thanksgiving toddler activities with my kids and they are great activities to try because they’re fast, low prep, and totally entertaining. This one is so easy to set up and it’s a crowd pleaser for toddlers and preschoolers. All you need is a strainer and some straws. Get them more involved by letting them make the turkey face! I hope that you’ll have lots of extra cardboard in your recycling bin while you cook Thanksgiving dinner. Because you’ll need a box or two for this simple match game. Cut the cardboard up into even squares or relatively even rectangles. Then, put pairs of stickers on the cardboard. Just like the picture, you have one turkey sticker on one square and another turkey sticker on another square so that kids can play the classic matching game with them. Easy peasy and you don’t have to panic if you lose one of the pieces. Just grab another box from the recycling! Make a quick turkey from colored paper and let kids match the colors with corresponding stickers. My kids adore these stickers and they’re SUPER easy to grab at any store like Kmart, Staples, or even on Amazon. 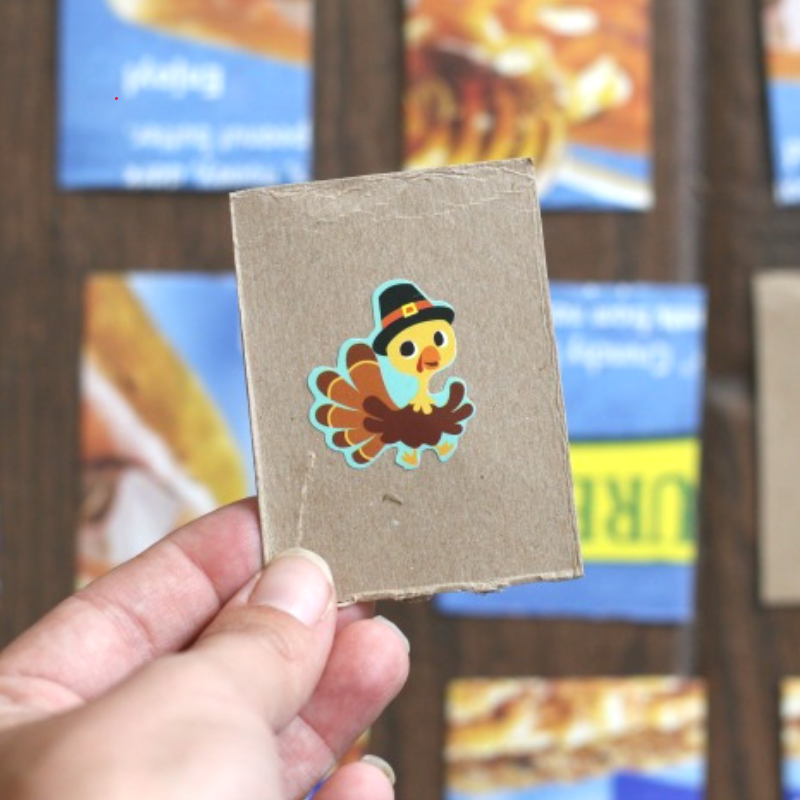 Get all of the details and tips on how to make the best turkey sticker match EVER over at Busy Toddler. This reusable puzzle is a HUGE hit with kids. Just cut out a few shapes from foam sheets (we got ours at Michael’s craft store, but you can get them through Amazon too). Then, let kids “stick” the foam turkey pieces to the window by painting the backs of the pieces with water. You can use these foam pieces on windows, bathtubs, or little brothers… you choose. If you have an older toddler or preschooler, you could easily make this adorable crayon resist turkey. It’s the perfect activity if it’s cold outside or you need something for the kids to do at the table. 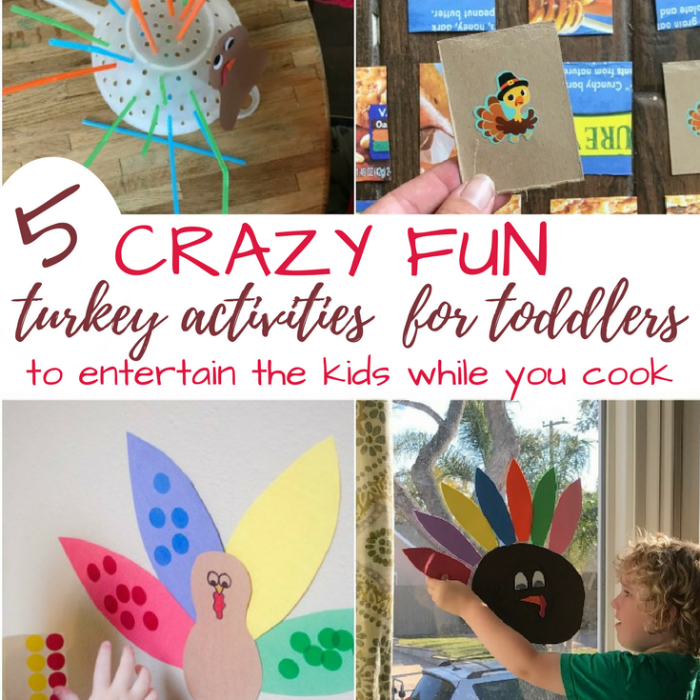 Get all of the details and tips on how to make the best crayon resist turkey over at Munchkins and Moms. All it takes is a little bit of prep to keep your toddler happy so you can watch potatoes boil. Need more ideas to keep your toddler happy? We share daily kids activities over on Instagram so that you DON’T have to spend all your time searching for ideas on Pinterest, Google, or by looking over your friend’s fence…. (kidding). Get fun ideas over at Busy Toddler, Munchkins and Moms, Days with Grey, and Happily Ever Mom.